The restoration of the Mill at Freedom Falls first entered our consciousness shortly after our son and daughter-in-law purchased farmland adjacent to the Mill in 2006, and we caught sight of the Mill on a walk through Freedom Village. We were instantly struck by the beautifully classic lines of the old building, the incredible workmanship in the granite foundation, and the alluring idea of a non-polluting source of hydropower. In 2007 we contacted the owner to see if he might consider an option on the Mill and the surrounding property. In 2011 we signed an 18-month option to buy so that our research on the project could begin in earnest. In the Spring of 2012 we exercised an option to buy, and actual on-the-ground restoration began in May 2012. The timeline below covers 2007 through May 2012, for more recent updates, please visit our blog. The following timeline is not meant to be precise, but is meant to give an idea of the research and documentation that had to be accomplished in those intervening five years, 2007-2012. In order to save money, we chose to do most of the documentation and research ourselves. Tony talked with Josh Royte of The Nature Conservancy to determine if this was a dam that ought to be removed or whether it was one that could remain without adverse impact on migratory fish. Josh said there was no evidence of migratory fish at this location, so the dam appeared to be doing no harm; and, along with the upstream dams, might even be holding back introduced species that should not be released downstream. Tony talked to Andy Straz, dam engineer, about the condition of the dam and whether hydropower could be economic. Andy did his analysis in the summer of 2008 and confirmed the soundness of the dam. We consulted with Jay Fischer of Cold Mountain Builders who indicated that sections of the foundation were in disastrous shape, but the structure of the original mill was in remarkably good shape. Tony looked into various tax opportunities – energy credits, historic rehabs, possible CEI funding. Tony began to do research on Mill history. He spent a lot of time in the State Archives, Maine Historical Society, Belfast Library, State Library, etc. Tony visited the site with various engineers to get some idea of required. rehabilitation. He began to realize that the project wouldn’t work without utilizing state and federal tax credits for historic rehabilitation. Prior research proved beneficial to subsequent application for listing on the National Register. 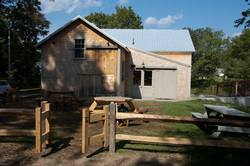 We met with John Piotti of the Maine Farmland Trust to explore the idea of tenants for the Mill. John agreed to pursue the idea and thought he might tie it in with an EFN grant to revitalize downtown areas of Freedom, Albion and Unity. W met with CEI to explore various roles they might play. Scott Horty, Camden Real Estate, helped with valuation of the Mill and property. Tony continued work on tax issues, insurance, legal issues around installation of hydro, process of finding tenants, listing on the National Register and made a connection with SPOOM (Society for the Preservation of Old Mills). Tony and Jay met with Arron Sturgis of Preservation Timber Framing. 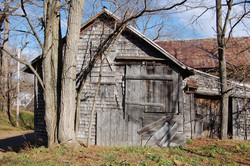 Aaron’s observations about the joinery turned out to be critical to the State Historic Preservation Office (SHPO) in establishing the relevance of the gristmill era to the rehabilitation. The Historic designation process is confusing and time consuming. Ultimately, the building had to be approved by SHPO and subsequently by the National Park Service for listing in the National Register of Historic Places, which, in turn, is a necessary precondition to having the rehabilitation plan approved, which then creates the availability of State (25%) and Federal (20%) historic tax credits. Interestingly, the tax credits are available only for buildings that are put back into commercial use, not for pure historical restorations. Tony met with Dana Murch of The Maine Department of Environmental Protection (DEP). Dana offered to help get through the complicated process of getting hydropower approval, but warned that the process is cumbersome and time consuming, even for “easily approved” projects that have no negative environmental consequences. Tony began looking for Engineer, Architect, Historical Advisor, Dam Engineer, foundation people, etc., and put together a project team. A critical step was the development by the structural engineer of a plan that would allow preservation of the historical structure of the original Mill but also meet current code. The toughest issue was developing a plan for the foundation, sections of which were in severe distress. Kleinschmidt Associates was hired to provide the dam engineering work. They soon confirmed Andy Straz’ initial estimate of production possibilities. The number eventually settles out at 79,000kWh per year, after allowance for downstream eel passage, aesthetic flows and continuous watering of the stream below the dam. Gary Cole of CMP figured out rules with respect to use of the power generated. The power can be credited against up to ten locations within the CMP service area that are in the same name as the producer of the power. This allows capture of the energy going into the grid at retail prices, rather than having to sell at wholesale and also sell the Renewable Energy Credits. We continued to meet with community members who were involved with the Mill in its operating days. Town Fire Marshall suggested that the Town might be interested, while this construction is going on, in replacing the dry hydrant at the pond with a charged hydrant at the foot of Mill Street, thus providing reliable, accessible water for fire fighting year-round and thus reducing insurance rates for all those within the village. Tony maintained on-going conversations with the SHPO (State Historic Preservation Office) about what parts of the building needed to be preserved and what parts could be reconstructed. A key decision was the approval of a plan that allowed removal and rebuilding of the various additions to the original structure. These additions were poorly built and have no real historical value, other than to demonstrate the evolutionary history of the Mill. To do this, these sheds must be reconstructed. Tony met with regulators and began to figure out the FERC (Federal Energy Regulatory Commission) process. This process is made more reasonable because we are proposing a “run of the river” type operation, rather than managing the water levels to maximize power. All the regulators are encouraging about the opportunity here, seeing no material negatives and lots of upside for the community in restoring the Mill and generating some “green” power. Tony met with CEI, which is willing to purchase the State Historical Tax Credits, thus providing a better return because of their ability to pay up-front and the fact that their purchase does not create taxable income. We met with David Conover to discuss the possibility of a documentary on the Mill. He is enthusiastic about the concept and the possible applicability to a larger story about New England mills, the proper use of water for power, and the importance of these buildings to their communities, both historically and prospectively. The regulatory nightmare is in full swing. All participants want to see this project happen and are trying to be helpful within the constraints of the rules, but the process itself is complicated and requires lots of formal process (such as public notices of meetings, etc.). The draft FERC application is done – 22 copies, 75 pages. We attended numerous Town meetings (Planning Board, Select Board and full Town Meeting) to get necessary zoning changes. Everyone in town (including the Code Enforcement Officer) was enthusiastic about the prospect of saving the Mill and very helpful in getting through the approval processes. We determined cost of building and hydropower restorations and arranged financing. We submitted, and had approved, the nomination for listing in the National Register of Historic Places. We submitted application to USDA REAP program for funding of 25% of the hydropower costs – 120 pages. A Planning Board site walk and hearing were held. The enthusiasm generated by the project was nice to see. Tree removal began (large trees by Sunset Knoll, smaller ones by Tony). Tony conducted a site walk with the first potential tenant, who is considering starting a school which might occupy the second floor. Tony talked to FEMA (Federal Emergency Management Agency). No regulatory issues arose, but we need to get flood insurance, which is available without much flail because this is an historical structure. Tony continued to work with Fire Marshall for final permit. There is a complicated set of trade-offs in a rehabilitation between preserving the historical character of the building and making it compliant with current codes. This applies to all the re-design work, but most importantly to the need for ADA accessibility as well as compliance with Fire regulations. We talked further with Maine Farmland Trust about possible tenants. Tony received comments from FERC on our draft application for exemption from licensing. Considerable changes in the application need to be made, but there appear to be no substantive issues. Kleinschmidt Associates was helpful in flushing out answers to the various issues raised by FERC. Deconstruction began! Lots of small treasures were found including old hardware and tools. Tony met with REAP. Use of federal monies requires more paperwork, and we will miss this year’s funding cycle. Application submission date is still good, but we will not get reimbursement until 2013. Arron and Rod’s team began removing roofing and cutting away sheds. David Conover, documentary producer, interviewed local “old-timers”, who remember the mill when it was operating.